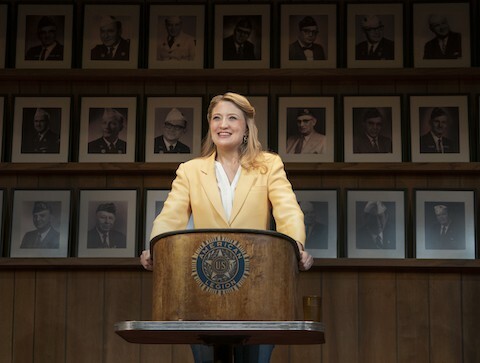 When writer-performer Heidi Schreck was 15, she traveled the U.S. giving speeches about the Constitution for prize money that paid her college tuition. As an origin story, it sounds almost impossibly quaint. Who can imagine mustering such civic zeal today? As recent events sadly continue to prove, women’s full humanity is still on trial more than 200 years after being omitted from our founding document. 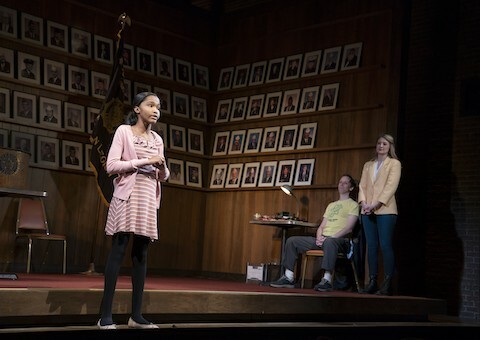 Schreck interrogates the legacy of America’s legislation of women by revisiting those teenage debates in What the Constitution Means to Me, which opened on Broadway tonight after an acclaimed and extended run downtown last year. 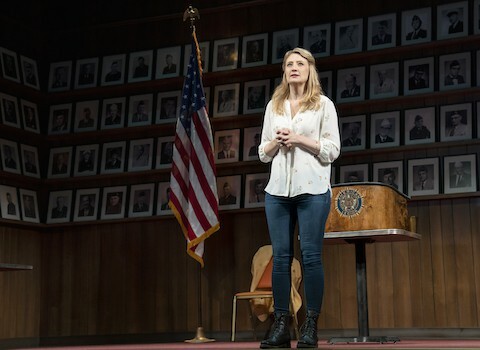 The result is by turns deeply funny, heart wrenching, inspirational, and one of the most searing and enlightening pieces of political theatre in recent memory. 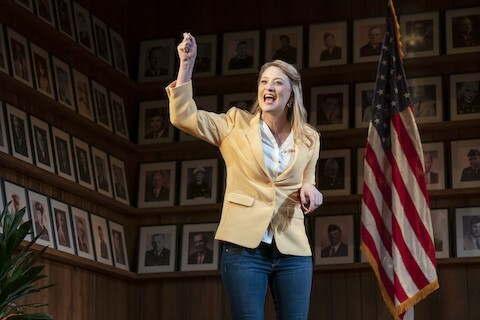 If you have been paying attention and are mad as hell, if your faith in America has been tested past the breaking point, if you feel like putting your head between your knees and wailing until your voice runs hoarse, get yourself to the Helen Hayes Theatre. You’re in excellent company. “What does it mean,” Schreck asks, “that the document will not protect us from the violence of men?” The statistics are startling, but nothing new. As Schreck puts it, “more American women have been killed by violent male partners in the last century than Americans have been killed in wars, including 9/11.” And that’s just women killed by men who supposedly love them. “I think you can feel it kind of humming underneath… everything,” Schreck says, referring not just to the threat of violence women face every day, but to the deadly consequences of such disregard for their lives. When Schreck began work on the show 10 years ago, she could hardly have imagined it would greet a country in the midst of a constitutional crisis. But it’s more than timing that makes Schreck’s performance one of the most thrilling and alive on New York stages right now. Schreck is a remarkably sincere storyteller with a gift for staying uncannily present in the room and in the moment, an even greater feat in the show’s move to Broadway. In Schreck’s hands and under Oliver Butler’s direction, What the Constitution Means to Me feels like a vital conversation, a sit-in, and a seance of sorts for the soul of the country. It even turns into a live debate. New York City high school debate champs Rosdely Ciprian and Thursday Williams alternate performances sparring with Schreck in a showdown ultimately judged by an audience member. The question? Whether we ought to keep the Constitution or scrap it and start over. “My mom says when you get worried that everything is moving backwards, that things are getting worse instead of better, you should imagine a woman walking along a beach with a dog,” Schreck says. Picture the dog scurrying back and forth, but recognize that the woman continues to move forward. The world has no choice but to follow.